Interesting idea, a diffferent approach than what I was taking. I will have to try it out and see what I can do with it. I built a wire bending jig for the linkage wires to the coxa encoder since I couldn't find anything else I liked. I made the first set of springs just a bit too short so they keep pulling out of the encoder arm. The next set will be about 1/2 inch longer and I will use a screw at both ends to anchor them. My initial runs using them went well, the readings are consistent and reliable. The PID loop runs much smoother now for the coxa movements. In other mechanical news, I have been thinking about how to use these encoders on the femur and coxa movements. After a lot of deliberation I decided not to replace the linear actuator potentiometer with an encoder. The main reason is that the encoder measures 0-4096 in 360 degrees of motion. Since the potentiometers rotate about 3600 degrees this would require some means of counting the rotations and maintaining that reading between leg controller power cycles. Although I have used the upper portion of the EEPROM to store data like this, it requires another cog for I2C communications. If the current leg position data is not stored then some type of calibration routine would be required during each startup. Although there are ways around each of these issues, I think I have a better idea. I will use the encoders to directly measure the angle of the two sides of the parallelogram that are controlled by the 2 linear actuators. I would mount the encoders on each side of the leg beside the main pivot. An arm attached to the encoder would then be attached to the 2 sides. This allows direct reading of the angle within the 360 degree rotational capabilities. I envision machining a delrin housing for the encoder that will attached to the lower section of the leg supports. I'm still thinking out the problem and have to put some of these ideas into the CAD/CAM program and see how it turns out. I will use the encoders to directly measure the angle of the two sides of the parallelogram that are controlled by the 2 linear actuators. I would mount the encoders on each side of the leg beside the main pivot. An arm attached to the encoder would then be attached to the 2 sides. I applaud your decision to use the encoders to measure the angle of movement of the leg elements as that is what is important not the linear distance of the actuator. Since the IK equations push out an angle, using the encoders to get the angle makes it easier. Of course I still have to draw up the CAD files for the housings and machine them but thats half the fun! I'm sure I will have the opportunity to change my mind several times in this process but my napkin drawings should work out with a little modification. The mill has been sitting silently way too long, it will be good to make some fresh metal/plastic shavings! Here are some photos of the mechanical arrangement of the coxa encoder. Here is it all put together with a spring on either side (needed for consistent readings). The white stuff on the screw is small diameter heat shrink to take up slop in the wire loop around the screw, got better readings this way. I re-installed the BobCad software (V25) on my new computer and got it re-authorized. I started work on the design for the Femur and Tibia encoder housings. I have to practice with the software since its been a while since I used it last. It isn't hard to use but its got its quirks just like any other software. Luckily I bought the video library when I got this so I can always look up things I forget. I broke the bank and upgraded my CAD/CAM program from BobCad v25 to v29 as a Christmas present to myself. I also got the training video to go along with it. So I'm going to be refreshing myself on how to use the software again since I haven't had another project that I could practice on for a while and there a bunch of new features to play with. Further testing of the magnetic encoder is going great. I ended up totally rewriting the PID software from scratch based on what I have learned over the last few months of testing and more research. I have the new simplified PID loop running the coxa motor with the magnetic encoder and I was pleasantly surprised at the responsiveness of the motor to various commands. The Integration portion of the PID isn't working quite the way I want it to yet, it may be because I am using only integer math and not floating point math (due to speed concerns), more work is needed there still. It looks like I may be able to remove the Derivative portion as it doesn't appear to be appreciably adding any value based on the type of movements the leg will be making. Even so, with the previous PID loop using potentiometer feedback I was getting a 3-4 degree movement for any command and lots of noise in the output. With the master leg gait loop requesting very small changes, the leg ended up oscillating due to overshoot. With the new PID loop and without any serious PID tuning, I am getting 0.3-0.4 degree movements reliably (I haven't tried this in combination with the master gait program, the other axis still don't respond as smoothly as I want them to). With this success I decided to put my efforts into finishing up the design for magnetic encoders on the femur and tibia. These will be connected directly to the leg movements and not the linear actuator so I can have an absolute reading of leg position at any time. I've got a workable design figured out for the encoder housings and leg attachments, just need to get them in the CAD program so I can machine them. The goal was to minimize the amount of re-work on the existing parts and I believe I can do this with just 2 new screw holes on each leg support bar. I will build up one for testing and modify it as needed. I plan on using the new PID loop for all 3 axis of rotation and will be working to combine them into a single cog. This will free up at least 2 cogs for other future changes. I don't expect to get a lot more done before the end of the year, I'm back to working 12+ hrs a day on night shift through the end of the year. Keep tuned in, there is more to come! I ordered 15 more magnetic encoder assemblies from Germany, they should show up in a couple of weeks. In the meantime I am working on the encoder enclosure design (back of the napkin layouts so far with dimensions). Not quite ready to put it in the CAD space, I still need some time to view the training videos for some of the newer functions on the software. I only get one night off (still on night shift) this week and should finish up nights just in time for Christmas. So I don't expect to get much more done before then. Hopefully the week after Christmas will be slower since I'll be back on 8 hour days so I should have time to get some more work done. Have a great holiday and talk later! Got an email that the new encoders are in snail mail from Germany! In the meantime I am finally off of 3 months of night shift (!) and re-learning how to sleep at night. I have finished the basic drawings for the housing for the femur and tibia encoders. I need to get the rough drawings into the CAD program and then machine one out to check all my dimensions are correct. I should be able to use the same housing for both encoders. I'm ready to start playing in BobCAD/CAM more so hopefully I can get the design finalized quickly and machined out. I haven't had any excuses for running the mill for a while and I have a new mill controller to try out also. Merry Christmas to everyone and have a great New Year too! This was a good weekend, I have learned enough of the new version of BobCad to create good CAD and CAM files. The first version of the housing showed me the mistakes, the second round was much better. I still have a couple of small changes to make to the CAD drawings and I'll be ready for round 3! Another couple of hours on the computer and I'll be ready to cut out another housing. Hopefully this will be the last test! Photos to come soon! Finally got the video for the magnetic encoder published!. I show the mechanical housing design for the magnetic encoder. The main goal was to create a housing that looked good and did not require a re-design of the hexapod leg. The housings only require 2 new threaded holes for each housing and will be measuring the actual angle of the leg components. I still have to machine the parts that will hold the threaded rod on the movable leg parts but I have some ideas for that also. Over the weekend I soldered the wiring harnesses together and got the wires run to the correct locations. Next item will be programming the PID loop for the motors and testing each feedback loop and seeing how much the resolution may have improved. great progress, a magnitude more on resolution. Woohoo! Good Idea on mounting outside on the joins. No need to manufacture all the legs again! Knowing that people like you take care of our nuclear plants makes me feel good. Funny thing is that I am still not sure if you have the big one walking before the P2 comes out or if Chip will be faster. To me it looks like a close race. Glad to hear that it was going so well. Did you attempt to attach a video to your last post? All I got was a big blank space. Really looking forward to seeing some video! I'm glad I held off commenting about the white space this time, too bad Publison can't fix this overcast rainy day, and clear up my reception. Way to go DiverBob, in finding a semi-easy work around to your encoder problems. I enjoy keeping track of your updates. Wishing you smooth sailing from here. Diverbob: Much continued respect for your long term project and the fantastic work and fine documentation you do. What a great labor of love. When this big bot takes its first steps it will be so sweet for you and also the rest of us who have tracked your progress. Your craftsmanship is superb and very inspiring. Thanks for the encouragement everyone! I've said before that I use the forum as a type of motivational tool. If I find myself not working on the robot, I need to do something useful so I can have a decent posting here! Mostly the work has been fun and educational. It's been a chance to learn a lot of new things and get some interesting programming done. I really hope that the magnetic encoders work out well, the issues with the the actuator potentiometers has been frustrating in trying solutions to their inadequate outputs. I would be much further down the road toward getting this robot walking if I hadn't been spending so much time trying to code around the issues. Bob, do you have a link to the site where you ordered the HH-12? Contact Georg Hylinski directly at DF1SR@arcor.de for details on the HH-12 encoder. You can Google the encoder and see a few examples of their use on the internet. Not having a lot of luck right now. I accidentally damaged 2 encoders due to wiring errors that I should have caught much earlier than I did. Now I have to remove those encoders and set up 2 other encoders, good thing I bought extras!. This all comes from trying to hurry to get the test leg going before an arbitrary date that didn't matter in the long run and trying to do too many tasks at once. So back to the drawing board and slowing down to make sure everything is done correctly before starting the next step. It's time for a break anyway, Michigan gray winter is depressing so its time to go to sunnier climates for a while. See you when I get back! Michigan gray winter is depressing so its time to go to sunnier climates for a while. See you when I get back! Have fun DiverBob, here in Ohio it has been grey for awhile. Hope this burning things isn't catching. I'm finally back, I think this has been the longest break from working on the robot yet. 3 weeks of vacation and diving was nice but its time to get back to work on the project. Tonight I re-visited the encoders and validated that the wiring appears to be correct, or at least the wires were going to the expected locations and the multimeter confirmed no opens or shorts. I hooked up another encoder that I knew was good (I tested it back in February) but when I ran a simple demo test code I did not get the expected output. The output continuously outputs the value 4095. I enabled the debugging statements and I don't see any issues, the output string is coming being recieved and parsed but never changes with the shaft position. I changed the propellor pins incase that was a problem but no go there also. Since there have been no code changes to the test program I'm scratching my head. My next step is to wire up a new encoder and try it out also. I didn't get much done, just wanted to dust everything off and get a new baseline to work from. I wasn't expecting no response from the previously 'good' encoder. It's been a good robot weekend so far. Removed the defective magentic encoder and soldered in a new one. The test program worked great with no issues. Tried out the other encoder and it was working correctly also. Glad to get that out of the way, still don't know why they didn't work earlier, the only change I made was to use another set of output pins on the prop. I didn't go back and try the other pins again, maybe later. This allowed me to work on coming up with a method to rotate the encoder shaft. I wanted to avoid having to drill any holes in the aluminum or have to disassemble the leg if at all possible. 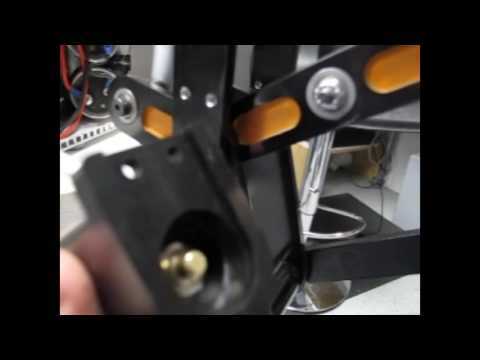 I was going to create a delrin clamp that fastened around the leg piece that moved but come up with what I think will be a much better solution. I have several shoulder bolts with nylon locknuts used to fasten all the leg parts together. I realized that I can remove a nylon locknut and create my own 'nut' out of delrin. This requires 2 'nuts', one that is .8" and the other .6" tall (diameter doesn't really matter, I found some delrin stock that is 0.625" diameter to use.). A perpendicular hole that is threaded to 4-40 is on the other end of the nut from the tapped threads. I will cut some 4-40 all thread to the correct lengths and it will provide a rigid connection so that all leg movements will be picked up by the encoders. I'm taking a dinner break but will finish making the parts needed tonight and start putting everything back together next. Photos to follow! I found the camera, it got put away after vacation in the wrong spot. These photos show the attachment point and encoder shaft movement mechanism. The delrin 'nut ' replaces the nylon insert nut at the point where the tibia actuator attaches on one side and the upper swing arm where the femur actuator attaches on the other side of the leg. A length of 4-40 threaded rod connects the two points. In 2 of the photos there is a heat shrink covering over the thread so it blends in with the rest of the color scheme. Due to the change in layout I have to make another test housing since the slit where the rod comes out is on the wrong side based on my earlier plans. The 'nuts' are not threaded where the 4-40 rod enters, it is a close fit hole instead. This allows the threaded rod to slide back and forth as needed in case the encoder shaft isn't exactly centered over the pivot point. I want to minimize stress on the encoder shaft as this could become a failure point over time. The other end of the rod threads into the delrin disc that fits over the encoder shaft. Since I need to make a new encoder housing I am going to add a couple of small improvements, one being another screw hole for the cover so there are 3 screws holding that down. I haven't designed the encoder covers yet, I'm in the process of ordering a 60W laser cutter/engraver and I want to use it to make the covers. Since there is a 7-9 week lead time for delivery after ordering it will be sometime in late spring or summer before I get it setup. That's not a critical part, just for aesthetics so no impact on the robot testing. Cool, I love how you: reduced weight , gave style, and accentuated the machine work with contrasting paint. Do you have a concept picture of what a final build would look like? BTW: Happy to see things going your way. Cool, I love how you: reduced weight , gave style, and accentuated the machine work with contrasting paint. Do you have a concept picture of what a final build would look like?. That isn't paint, its a 2 tone anodized layer that is dyed black and gold. I don't have any overall picture of what this will look like but it is inspired by the Odex 1 robot so I am using it as a guide. There will be a round acrylic ball on the top with LIDAR and cameras inside it eventually. My version is around 2/3's of the originals size and less than 200 pounds. Right now I just want to get it to take its first step! Of course mine doesn't exactly follow the original design but is updated to use more modern techniques and equipment. Glad you clarified that's not paint. I went from one image I had seen. May just be a touch up. But then you said it was,stain, so put on with a brush is a possibility. Do you do the anodizing in house? I like the color scheme, black and gold. BTW: the finish looks almost like powder coat. I set up my own anodizing station in my basement after a lot of research! I have details on how I did the anodizing are in this thread starting around page 7 (at least on my browser....). There is even a video of the setup and process. Thanks Bob, I definitely want to read up on your anodizing station, Something I want to do for myself, especially if I could come close to the beautiful finish you have. Does it add a measurable thickness to machined surfaces? You probably answer that in your post. So don't mind me. But you are going to have one sharp looking robot after you are finished. As it will not be that portable, how will you show it off? Booking appearances at the local mall, or a half-time show at the ball field. You could travel the country with this, do you have a name for your leggy pet yet?